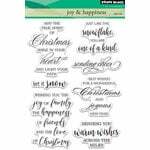 Create breathtaking Christmas cards with the Gilded Ornaments Shapeabilities Die Set from the Holiday Collection by Spellbinders. The package includes 6 thin metal dies that measure between .7" x .8" to 2.5" x 2.5". You will love decorating your cards with these ornaments that feature intricate designs, a bow and ornament hanger. 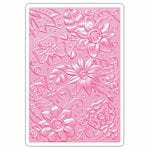 The dies will cut, deboss, emboss and stencil with a single etched die template and are compatible with most die cutting machines, sold separately. 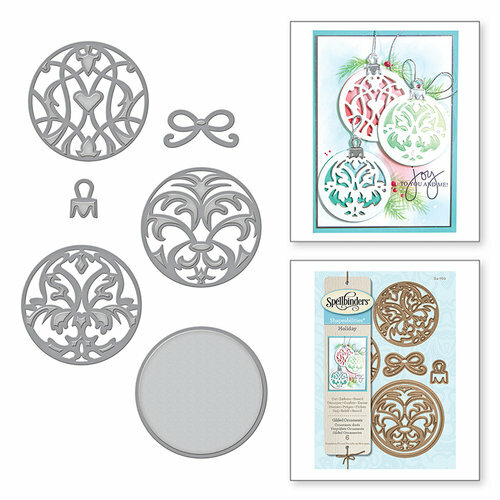 I love this ornament set, it cuts perfectly in the Platinum 6 machine, and i foresee lots of fun uses in art journaling with them too! Beautiful work Spellbinders! These are fun to make and cute when completed. I have used them with green and red background with white as the ornament face. The only thing I notice, which I think is my paper, is that they don't always cut all the way through. I do run it back and forth through my BigShot about 5 times but I am also using cardstock, which might be a little too thick. I would recommend this product for others to use and hope they have as much fun as I have been having with them! This is a great die. I already made a card with it. 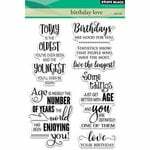 The die cut great and once I realized how to use it correctly it was smooth sailing. 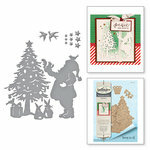 It’s versatile and you can use so many different types of paper and card stock.